A plant count experiment was undertaken in June-September 2009 as part of a La Trobe University honours project. Plant counts were collected for two months, after which it was difficult to distinguish plants from tillers, so composition and ground cover measurements commenced to determine the success of establishment. 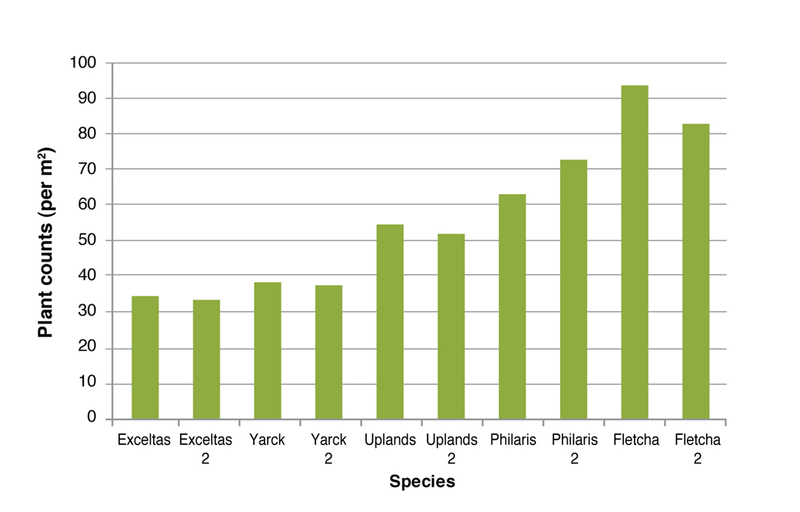 Overall, the fescue and phalaris were the strongest in establishment, while the cocksfoots were slower and more susceptible to weed invasion (Figure 1). The brome was the fastest out of the ground, but cold temperatures through winter stalled its growth early and it had a heavy weed burden by spring. Silver grass was a significant issue at establishment in Longwood, particularly in the cocksfoots and brome (Figure 1). 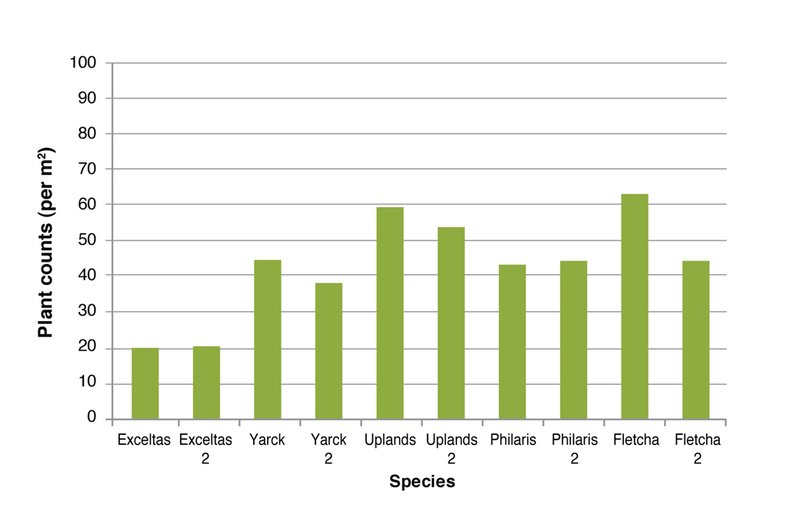 In contrast, the Euroa plots, which had been cropped for three years prior to establishment, had very few annual grasses (Figures 1 and 2). March plant counts (Figures 3 and 4) indicated that survival of the perennials was good at both sites, despite the very hot finish to the 2009 season (causing very low seed-set) and the heavy silver grass burden at Longwood. The early autumn break probably helped survival. The extent of the silver-grass infestation was greatest in the Uplands treatment which was the slowest to establish. Interestingly, despite being blanketed with silver grass for the whole summer, very few Uplands plants were lost. The fescue was the best performer at both sites and had the lowest weed burden due to a fast establishment. The brome had the lowest summer survival, and the group came to the conclusion that this species, which is shallow rooted and summer active, may not be suited to the region. Although the brome died over summer at Euroa, its large seed and low weed burden enabled it to regenerate from seed. Clover growth was poor at both sites, and this most likely was due to the fact that it didn’t seed very well in 2009, due to the extremely hot October. Thanks to the site hosts Andrew and Caroline Walta and John and Mary Kelly for hosting the sites, managing the cattle movements, recording weights, rainfall, grazing data and above all their commitment and passion to this project. Thanks also to the members of the Euroa Grazing Group – the project would not have been such a success without the drive and enthusiasm of the group. This project was funded by Meat and Livestock Australia (MLA) and the Agriculture Victoria as part of the MLA Producer Demonstration Site initiative. Significant linkages were made to the BESTWOOL-BESTLAMB and EverGraze project extension for the project. Smyth Seeds and Stephens Pasture Seeds provided seed for the trial sites.